...to state quite simply what we learn in a time of pestilence: that there are more things to admire in men than to despise. ...once I admitted the arguments of necessity and force majeure put forward by the less eminent, I couldn’t reject those of the eminent. To which they retorted that the surest way of playing the game of the red robes was to leave to them the monopoly of the death penalty. My reply to this was that if you gave in once, there was no reason for not continuing to give in. It seems to me that history has borne me out; today there’s a sort of competition who will kill the most. They’re all mad over murder and they couldn’t stop killing men even if they wanted to. 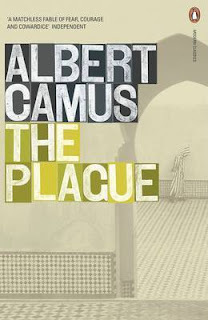 Obstinately humanist, what a superb writer Albert Camus was. I look forward to The Rebel. I read it again last year, for the first time in decades, having first read it for French A level. He was a wonderful writer.